Work has been super busy making up for the holiday down time, I am feeling a little fried and it’s only Tuesday! So much to do this week, ugh! And there are a few new viruses running amok because I spent much of the day removing them. Not opening a strange attachment from your personal email on a work computer isn’t common sense apparently! 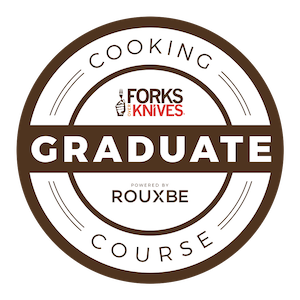 Always a fun learning experience. 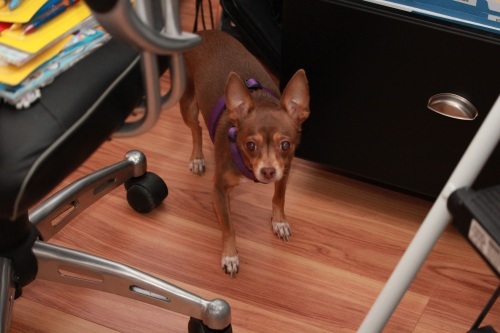 And apparently my dog is having a learning experience of her own figuring out our new camera just might be a camera. Perhaps us stalking her around the house with it for the last 10 days has given it away. But she still can run from it. 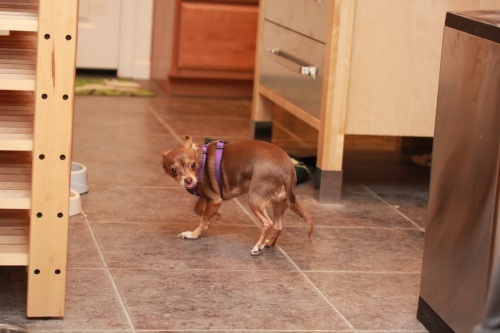 Or maybe she was running because she knew I was getting crazy with curry for dinner. Awhile back, I saw a recipe online somewhere for a curry banana reduction sauce for chicken. It was pretty far from being a vegan recipe, but I thought about it for dinner and decided to make my own veganized version for a tempeh stir fry. 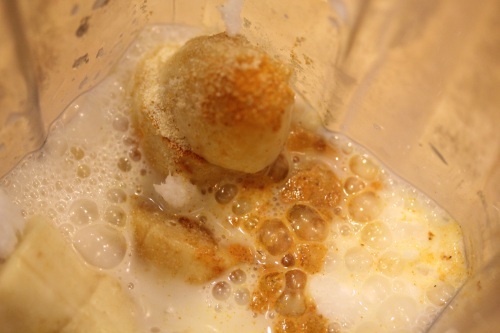 Place all ingredients in a high speed blender and blend to a smooth texture. 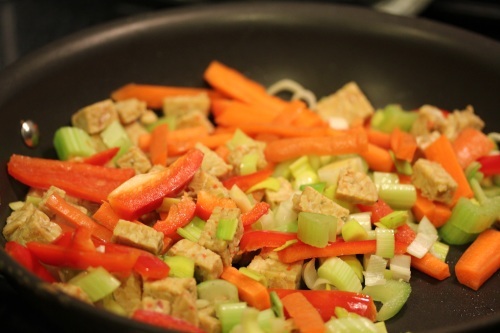 For the stir fry, I used tempeh cubes, celery, carrots, red peppers and chopped leeks. Of course, you can use whatever ingredients you like in a stir fry. Heat 1 tbsp. of coconut oil over medium heat in a skillet or wok and saute ingredients until cooked and maybe a little golden. 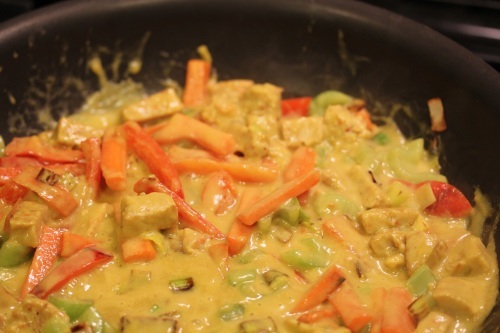 Pour in the curry banana sauce, thoroughly stir and simmer over low to medium heat covered for about 5 minutes. Then enjoy! 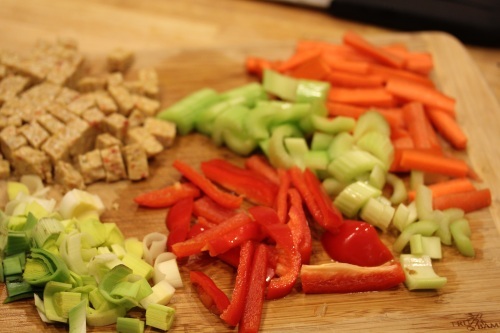 Sauce covers a 4-serving stir fry dish. The sauce is a crazy blend of spiced banana with a curry kick, a little sweet and sour action and the perfect amount of curry. 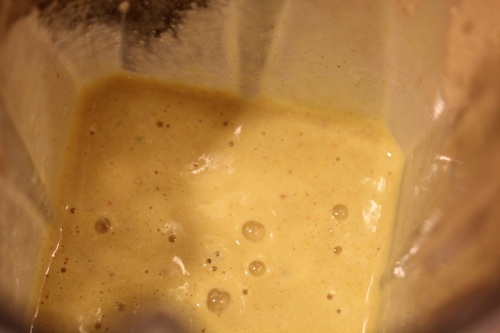 And the texture is just right, creamy and thick, like a savory pudding that coats everything nicely. Another plus is it came together fast, throwing the sauce together in the Vita-Mix just takes a couple of minutes and cook time is only about 15 minutes – perfect after a busy weekday. 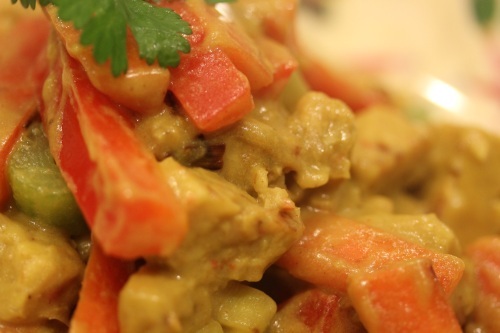 If you’re a curry fan, give this recipe a try. Omg this looks awesome, Christine! i love that you used bananas in the sauce…I bet that just added such great flavor to it! It does look so thick and creamy and perfect! Your photo quality gets better with each post…I love your new camera skills! Thanks! :-) It was a great sauce and you may want to try the spices for the first go because they’re not too strong. Thanks on the camera, I swear I will be sending you an email with lens information soon! It’s a crazy combo, but it works well together. And the sauce could go on a raw or cooked meal. 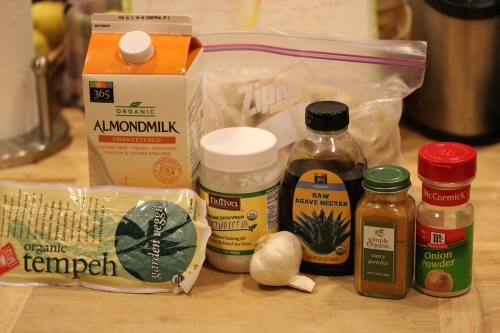 Tempeh is good, has a crunchier texture and nuttier flavor compared to a firm tofu. And it mas a much higher protein content. 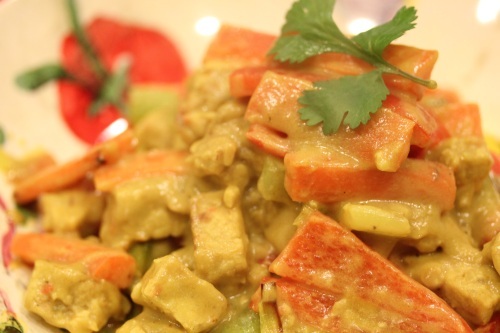 I am a curry nut, and this looks amazing, as always! Genius idea! 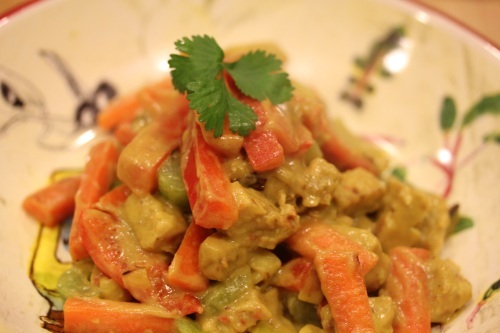 I love bananas…and curry…and all things stir fried! So the combo just sounds totally fab to me. Great pics too.